We made it super easy to customize your checkout shopping cart to ease your blog shop / store submit orders via auto invoice e-mail. We wanted to simplify and minimize the use of complicated codes, so you as blogger shop / blog store owners can quickly set up your on-line shop in minutes. Dropship agents will mostly benefit these settings as they can simply organize their delivery charges (inclusive discounts) according to their nominated carrier service package. This way, the amount invoiced via the automated e-mail sent to customers will include the necessary delivery charges required. This tutorial will let your user choose, during shopping cart checkout, the delivery area while you as blog shop owners can set and customize the charges applied according to your carrier service of choice. The customized delivery charge that you have included, will automatically be added and calculated in the automated e-mail invoice according to the items selected by your user upon sending the orders. In whatever preferred blog shop / store template from our Blogger e-commerce store template with shopping cart collection, go to your customize checkout page or widget. Personalized password needed to show full customization code snippets for extending delivery charges in your checkout form. Get your exclusive password via your e-mail by inserting your valid e-mail address below and verification. Get your password via e-mail. If you have the password with you, please insert your password by clicking the link below. Full tutorial and code snippet provided to easily copy and paste in your checkout form. Easy to customize your checkout delivery charges. Full shopping cart checkout delivery charges customization code snippet will display below once password is accepted. End of customization code snippets and tutorials. An example how the shopping cart checkout will display the above settings, you can find here at BlogrStore Responsive shopping cart Blogger template. Click on the cart icon and view the Delivery Location section with the drop down menu. Currently this Blogger template is using the above code snippet. 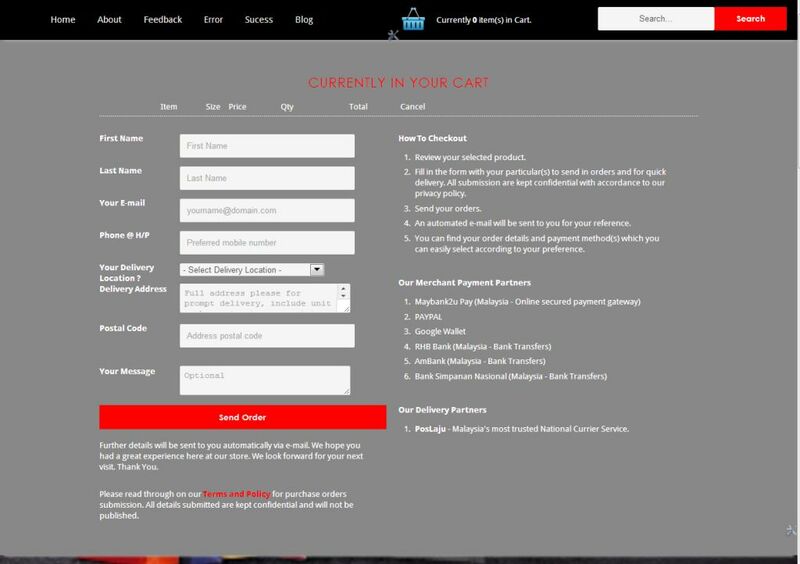 As you can see, you can customize the Delivery Charges according to your carrier service requirement. If any additional charges updated by your carrier service, you can easily update using the tutorial above. This way you have more control and simplify your users checkout and reducing abandoned orders by your users.